Golf Zoo's Blog: Golf industry veteran, Marcus Blake, joins the team! We are pleased to welcome the newest addition to our Golf Zoo team, Marcus Blake! Not only was Marcus actively out on the links, but he was also involved in the industry through other channels. He has appeared on numerous radio and television programs as a guest speaker on a variety of golf topics, and has been both behind the scenes as well as the frontman. He created, produced, and hosted “The Positive Side of Golf” radio show in Denver for 6 years and “Desert Golf Radio” in Phoenix. He covered a variety of content, including: easy-to-understand golf tips, fun golf stories, methods on picking the right golf course, ways to prevent injuries, and the correct way to play golf & enjoy it. 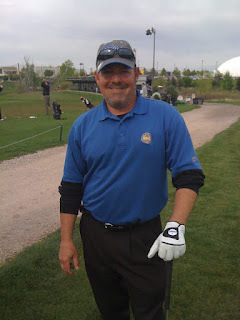 Marcus also wrote a sister column called “The Positive Side of Golf,” which appeared regularly in Colorado and Arizona. Marcus was head staff writer, reviewing golf courses in in Mexico, Colorado, Arizona, Nevada, California, Idaho, Oregon, Florida, and New Jersey. He also reviewed resorts, restaurants, and other facets of the typical golf lifestyle.